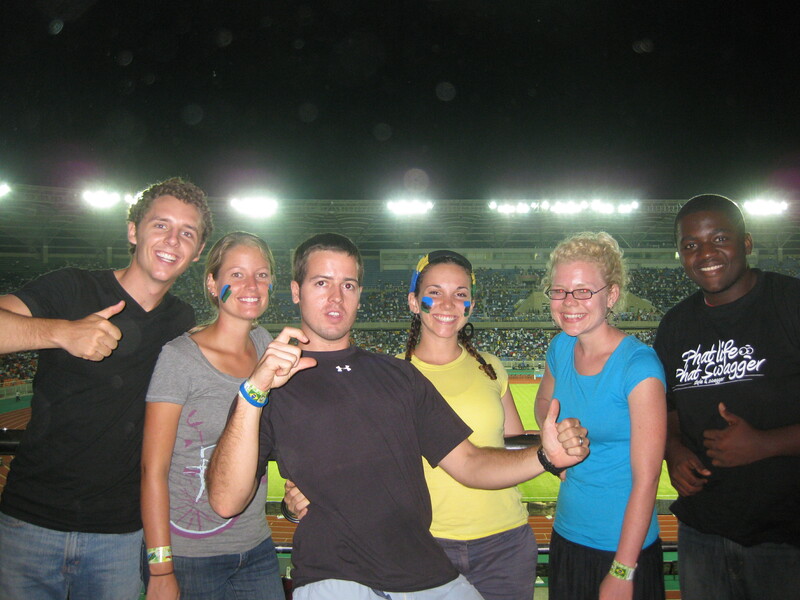 Our brief encounter with the Fifa World Cup 2010 | KARIBU! Well as you probably already know the World Cup has begun! Being in Africa, we can see the excitement all around us. People have been talking about it since we arrived. 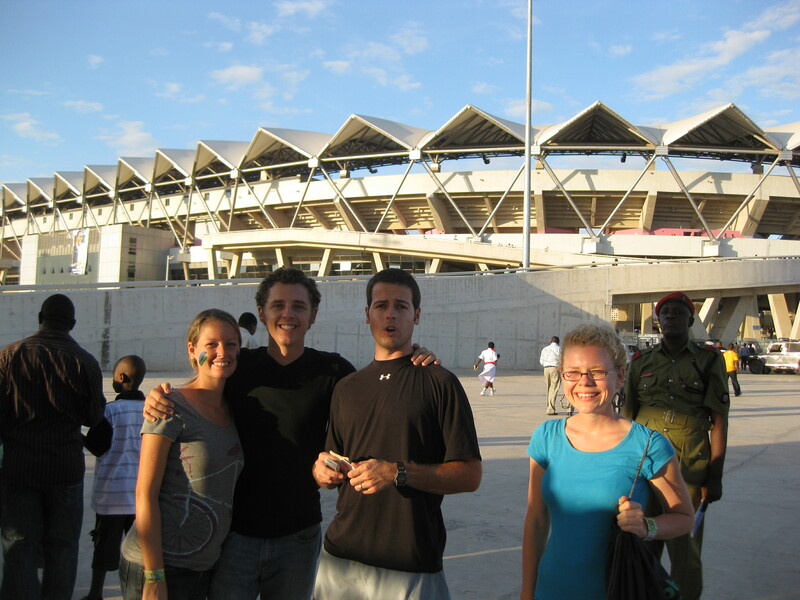 Many of our Tanzanian friends are so proud to have such a World Wide event here in Africa. When we first got here, we were under the naive impression that it would be cheap and easy for us to get ourselves tickets to the World Cup. We quickly found out that this was not the case. It is not cheap or easy at all. In fact, just traveling around Tanzania is not cheap or easy. With that being said we realized our hopes of going to the World Cup were not going to be a reality. Being more the type of people who like to play a sport, than watch it we were more than content with joining our friends here and there to watch a few games on the TV. However, one day a few weeks ago we heard a rumor that Brazil, one of the number 1 contenders for this year’s cup were going to come and play the Tanzanian team here in Dar es Salaam. This was something we all were excited about and so we decided to go. Our good friend Shaun waited all day long in a place that we were not even sure really had tickets. When the tickets were finally delivered they were brought in an old beat up dala dala with 6 men selling tickets out the window and people crowding all around trying to get their tickets. No such thing as lines and organization for this one. We left early after school, decked out in Tanzanian colors, for the adventure with a group of our friends, so that we could avoid traffic. Thankfully, the traffic was not too bad and we got to the stadium in time. The stadium is just 2 years old and was built by the Chinese. There are many things all throughout Africa that have been build by the Chinese. 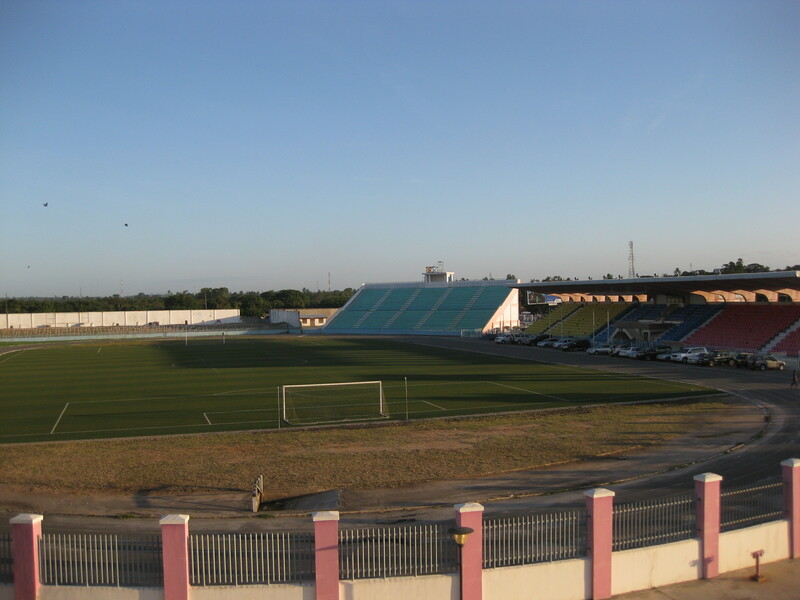 The stadium is very impressive, especially for Dar es Salaam. The old stadium is still right beside the new one, and it pales in comparison to the new one. Singing the national anthems inside of the stadium. Anyways, we were so very excited to be there to see some of the best players in the world playing right in front of our eyes. You could tell that many Tanzanian’s had never been to an event like this before. They were cheering for both teams and most of them were not sporting their own country’s colors. It was however, a great event. 1. During the Brazil National Anthem the men running the sound system were not able to turn off the advertisement blaring in the background. Sorry Brazil.. no disrespect. Whoops. 2. The power point and excel slide show, due to the fact that whoever was running the AV was not very familiar with the system. 3. A Tanzanian fan who ran across the field past security, gave Kaka a hug and then was quickly ushered off the field and given a stern talking from the Tanzanian officials. Of course Brazil won, and to be honest they were not really even trying hard. 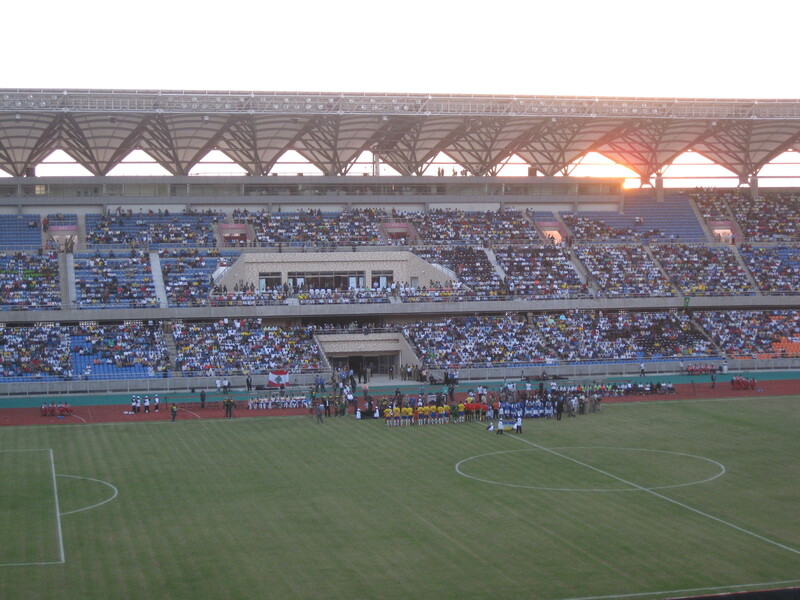 Tanzania did get one goal which was surprising and exciting! The final score was 5-1. This was truly one of those once in a life time experiences that I am very grateful. Maybe one day we will be able to go and see the real thing! BRAZIL 2014 ? There is always a possibility. Kaka right before a random Tanzanian ran and gave him a hug on the field. Coming together after scoring one of five goals.